My smoothies are quite simple: a handful of this plus a handful of that, whichever frozen fruits sound good at the time. I’m a proponent of the all-fruit smoothies (sans dairy) as they give me a big energy boost in the morning, one that lasts especially if I save a few sips – and I’m not worried about it spoiling a bit later because of milk or yogurt. Added bonus: when the cup is empty, add in ice-cold water and you have a refreshing fruit water that’s tasty and keeps you hydrated. Today’s smoothie was inspired by Red Jacket Orchards. This local New York State farm and juice company sets up every Sunday in the Tompkins Square NYC Greenmarket with tasty samples and buckets of their sweet drinks submerged in icy water. Every other week or so I’ll pick up a small bottle of Black Currant Apple Juice (amazing) or Joe’s Summer Blend (a refreshingly tart lemon apple). However, one Tuesday morning I was heading home from a run and I passed through a different Greenmarket on 2nd Avenue and East 10th Street in front of Saint Mark’s Church where I spotted another Red Jacket Orchard stand. I had no intention of picking up some juice, but the convincing salesperson invited me to try their newest product: Tart Cherry Stomp. Oh my. It truly tastes like cherries. I knew it’d be a great smoothie base, and with an especially strong flavor I could cut it with some of my beloved chia fresca. Sometimes I measure what goes into my smoothies, and sometimes I just wing it. If I do measure, I’m not following a recipe. I’m merely recording what I am putting into my concoction. I go through phases in which I do (and don’t) measure my foods. As both a female member of our species who has had her share of battles with weight management and especially as a vegetarian, I am curious about what I am putting into my body. I like to tabulate how much protein I am getting, which nutrients I might need to add into my daily diet, and how I’m doing overall. Caloriecount.com is my answer to all that. So today’s Red Jacket Orchard Inspired Cherry Smoothie? Blended up nice and smooth… delicious and not too seedy! I don’t like using chia fresca with raspberries, as you end up getting a mouthful of seeds. When paired with a bulky fruit like strawberries or seedless mangoes and cherries, chia seeds add a nice thick texture and slightly earthy flavor. I notice I feel fuller longer when I eat chia seeds, too. 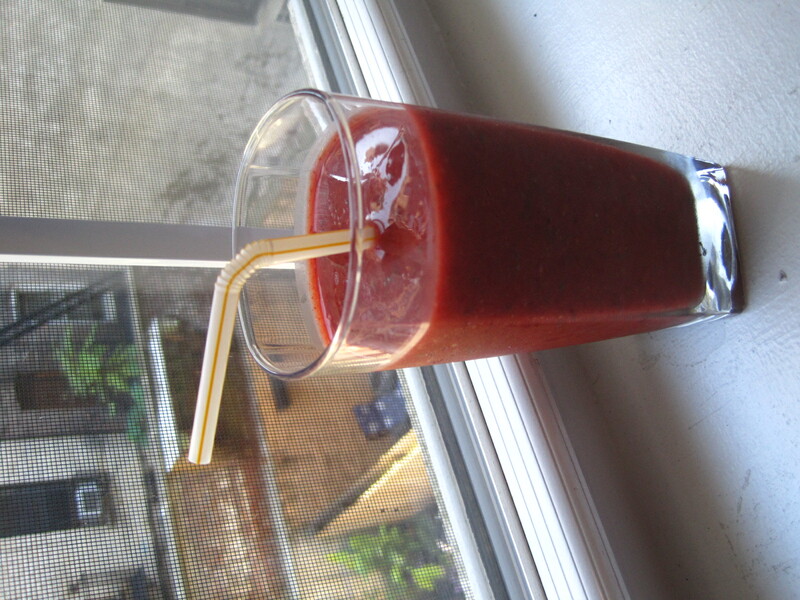 The analysis of this smoothie shows 191 calories and over 100% of daily Vitamin C requirement. Thumbs up for today’s mix! These sorts of thing are amazing in the morning. I agree with your sans dairy approach – I just want to taste the fruit. This smoothie looks simply divine. Yes, definitely a great way to start the day. Thanks!